Most marketers are now aware of the importance of a brand purpose — a clearly defined reason for your brand's existence that goes beyond profits and ROI, has a clear benefit to society, and—at least in theory— provides a framework for every strategic business decision. Being purposeful has enabled TOMS Shoes, Warby Parker, Patagonia, IKEA, and other leading brands to gain a market advantage — and tons of positive buzz — in a business environment defined by a collaboration of social media and social consciousness. While skeptics will argue that purpose is a passing fad and buzzword and, the business case is strong. Kantar Consulting's "Purpose 2020" report found that purpose-led brands have seen their brand valuation increase by 175% over the past 12 years, compared to a median growth rate of 86%. Furthermore, Edelman's 2018 Earned Brand study, reported that 64% of consumers globally make purchases based on what a company stands for, a 13-point increase since 2017. Many brands do a superficial job of articulating why they exist, settling for exercises that lead to little more than catchy taglines and slogans. Some create purpose statements that are so generic they could apply to just about any organization. Other efforts are inauthentic and have no connection to the company’s DNA. Even among brands that articulate their purpose effectively, many stop there and go no further, doing little to integrate meaning into the day-to-day experiences of their employees and customers. Organizations with superficial purpose are not able to capitalize on the benefits of authentic purpose, including energized employees, stronger organizational alignment, unwavering customer loyalty, and the greater value that comes from making long-term investments in people, product and service offerings, and new markets. And, they may forego a fundamental element of purpose: its positive impact on society. 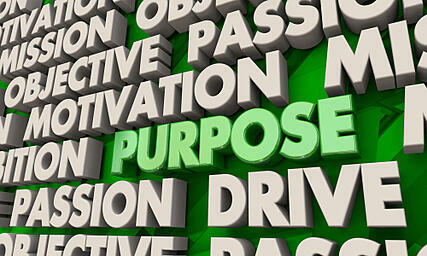 Activating purpose is becoming an essential strategy for brands to differentiate themselves, both large and small brands, and navigate the rough waters of volatility, uncertainty, change, and ambiguity (the popular vernacular VUCA). Research shows that purpose-led organizations are more popular with Millennials as places to work, increasingly attractive to consumers. Without a doubt, organizations that can weave into their strategy a mission to take on one of the notable challenges of humanity outlined in the UN Sustainable Development Goals can carve out a future competitive advantage to attract and retain the best talent by providing meaningful work and a sustainable future. The Body Shop has several ongoing initiatives, such as its ‘Forever Against Animal Testing’ petition to get animal testing in cosmetics banned worldwide. Its goal was to secure 8 million signatures to present the UN in 2018. Mastercard’s Priceless positioning is infused into everything the brand does from a marketing perspective, supporting its approach to the 4Ps. The company’s commitment to transparency resonates with the broader Mastercard team, close to half of whom are millennials, known for seeking out purpose-driven organizations. Marketers have various ways to bring a brand purpose to life, but social media channels can be particularly powerful. Twitter, for example, enables continual reinforcement of a narrative, not to mention sharing, which is essential for generating movement around a brand. While Twitter is generally considered an external marketing tool, it can also be used to get a company's employees fired up. Outdoor sporting gear brand, REI’s "#OptOutside" campaign, gave employees a paid day off on "Black Friday" so they could spend time outdoors in nature, rather than in shopping malls. Although #OptOutside was intended to inspire consumers as much as employees, the message reflected REI's brand purpose. The company used interactive tools to increase engagement and build momentum, including sending people a fun, nature-related GIF if they used the #OptOutside hashtag. As a brand consultant, I feel a word of caution is in order here: brands should be careful to use social media to showcase authentic manifestations of their purpose, not to tout their good deeds in a way that might appear to be self-serving. Purpose must come from a deep-seated belief from your brand that is then translated out to the consumer. Think about human-centric stories that will differentiate your brand and have an emotional resonance with consumers; show them why they should care, and invite them to engage.